when this one came across my radar in the form of the audio book I was going to turn it down. I said 'Oh, I'll take 'Off the Beaten Path' please and thank you' and a little voice came along and whispered in my ear (and by whispered I mean e-mailed me) 'Pins and Needles' is really good too' they said...so I went back to audible.com and listened to the sample again and said, yeah this could be good...what the he!!? Why not and that's how I got to be here writing this review...because you were dying to know, right? I know I'm babbling but hey work with me on this. I've been known to be entertaining. Ok first off there's a lot of legalese here but for me that was actually a good thing because this story is based on a legal case one that starts when petroleum engineer, Sean Wilkinson is hurt...we're talking lost one leg and nearly lost the other as a result of a work related accident, but because Hawk, the man who's been Sean's father for the past 10 years looks like a tattooed biker most lawyers are just walking away that is until Nate Delany walks into his hospital room and as luck would have it Nate looks more like a GQ model than a lawyer. Essentially everything that happens in this story from Nate and Sean's relationship is linked to Sean's case even Nate's relationship with his father which is tenuous at best becomes linked to Sean's case and there's a whole string of events in between that ultimately tie back into Sean's case. So truly I loved all the legalese...would I want it in every book no but it worked well with what was going on in this one. The secondary characters in this story were an interesting collection. Let's start with Nate's family. Nate has two brothers...Steve and Matt or Matthew...one's cool, one's not, in that order. Nate's parents...while I won't necessarily say that they're bad people neither would I say that they're anyone I'd like to know. Did I agree with their choices? No. Was it something that I would have done if faced with the same situation? No, but we all have to make our own choices and live with the consequences of them, so to each their own. Given the already strained relationship between Nate and his father it really came as no surprise when the quality of Nate's work as well as his work ethic are called into question at his father's law firm leading Nate to make the choice to walk away and set up his how law office and resulting in his first meeting with Hawk and a only somewhat conscious Sean. Sean's family is a little more complicated. Sean's life hasn't been easy. He's been abandoned, abused, past from foster home to foster home and yet somehow he's managed to rise above things and along the way he's found both a friend and a substitute father in Hawk as well as a valued friend in Tanya the other artist at Hawk's Tattoo Studio. Sean's doesn't let a lot of people into his life and to be honest he's not been given a lot of reason's to trust, so Nate's really got his work cut out for him if he's going to get past Sean's considerable defenses. Sean's not only incredibly intelligent but he's also very artistically gifted and while he may appear as nothing more than a simple tattooed thug...I think that's basically what Nate's father called him, he's not. Sean is so, so much more and thankfully Nate is really quick to see this. Both the author A.J. Thomas and the narrator, Jason Riley are new to me and I'm really glad that I listened to that little birdy who whispered in my ear that this one was good because she was right, and I'm definitely going to be checking out more by this author but also more by this narrator. His voices brought this story to life and added richness to the characters and an overall depth that impressed me. Definitely a narrator that I'm interested in hearing more from. With everything that's going on in this story don't expect any flash, bangs in the smexy times department because they're not going to happen the relationship between Sean and Nate is definitely a slow burn and with Sean's past anything different just wouldn't have seemed right to me. But having said that when things do finally burn...they were scorching hot between these two...after all there was that time in the tattoo parlor...and...sorry, you'll just have to read the book to find out or listen to the audio...cause that works too, right? While the ending for Sean's case seemed a little bit over the top I can't truthfully say that I was bothered by it. What intrigued me the most other than Sean and Nate because I really, really liked this pairing...was what was beginning to happen between Nate and his dad at the end. I could so be persuaded to hang around for more of Nate and Sean and to see what's going to happen with Nate and his dad...another book would be nice but I could be happy with a nice long story...I'm not greedy, really I'm not...much. 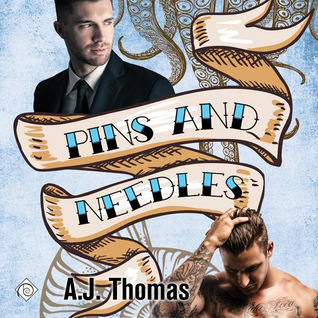 An audiobook of 'Pins and Needles' was graciously provided by the publisher in exchange for an honest review.